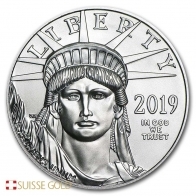 New 2019 1 Ounce American Eagle Silver Coin, 999 Fine. 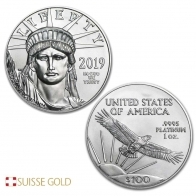 Each 2019 silver American Eagle coin features an image of Lady Liberty walking with hear arm reaching out, and the sun rising in the distance. At the bottom of the coin is the year of mintage. The American Eagle silver coin is the only silver coin produced by the US Mint. 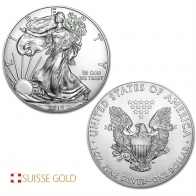 However, the US Mint also produces the Eagle coin in gold and platinum. In addition, the US Mint produces the American Buffalo and St. Gauden coins in gold. 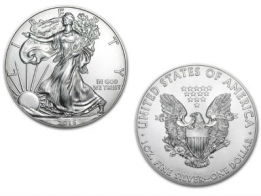 The American Eagle silver coin is a popular choice for gold investors, looking to invest into silver coins. These Silver American Eagles are brand new, uncirculated coins. Coin come in a plastic slip, or tubes of 20 pieces. Customers looking to invest in silver coins in larger quantities can also purchase the silver American Eagle monster box, which includes 500 coins. Silver American Eagles and silver Canadian Maple Leafs are very popular with individuals investing in silver coins worldwide. They are well recognised and available in large quantities. To sell silver American Eagles, please click here to contact us.